Personally, I’m astounded how far we’ve come in a relatively short 100 years. Entirely fascinating. In 1911, if you were driving a motorcar, it would likely be a Model T that was sitting on wooden wheels. They were probably between 21 and 24 inches tall, and had a speedometer gear on the back side. Inflatable tires were still very new to the automotive world, but added huge comfort to the vehicle because of the rough, turn of the century roads. 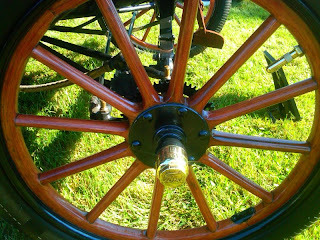 Wooden wheels like these were the norm up into the late 1920′s when steel took over. 100 years later, this 1911 Model T is running like a top, still rockin’ the wooden dubs, and still wrapped in black paint, like when Henry’s workers originally made it.